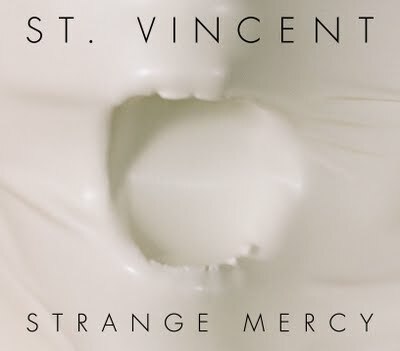 The great anticipation for St. Vincent’s third album, Strange Mercy, is credibly earned. 2009’s commercially successful Actor was a strong step forward from Annie Clark's admittedly phenomenal debut, Marry Me. While Actor managed to lend a guitar-driven backbone to many of its predecessor’s long stretches of drifty poetics, neither album felt superior to the other as much as they did complementary. It comes as no surprise that with the impending release of Strange Mercy, the spotlight is firmly on Clark to capitalize on the promise of her previous offerings. Both releases formed a well-seasoned combination of graceful melody and laconic edge- and it is this edge that the newest album repeatedly channels in interesting ways. Not so much a step forward as it is a confident appraisal of itself, Strange Mercy is art-damaged pop at its most polished apex. I swear this album feels like it has an actual swagger. Effortlessly sliding from resentful diatribes into sultry, nostalgic ballads, both Clark’s songwriting and vocals are in peak form here (as an aside, it doesn’t hurt that Clark’s public image is arguably the most well-honed and refined in all of hipsterdom with regards to mystique and magnetism). Strange Mercy moves with a headlong initiative unafraid of sloppiness, yet the production is ever anything but calculated and precise. Opener “Chloe in the Afternoon” reintroduces the listener to the world of St. Vincent with a cacophony of fuzzy guitars, modulated synths, and lonesome vocals all detailing a painfully jilted romance over a deliciously bizarre chorus structure and percussive arrangement. It’s a fitting start for Strange Mercy- while, structurally, the songs are never quite this unorthodox again, the listener remains aware of the possibility. “Cruel”, “Cheerleader”, and “Northern Lights” continue the trend- ranging from rousing, resentful anthems complete with symphonic snippets to upbeat sonic explosions. Both poignant and seductive, the lead single “Surgeon” is a tender mosaic of sexual innuendo and expression- “I spent the summer on my back”, Clark sings as she reminisces of a youthful affair from yesteryear. However, despite all the technical garnish, Strange Mercy is indisputably human with a subtle, honest intimacy at its core. The listener never doubts the pain is as real as the love. And for emphasis, Clark often opts for a more personalized approach. Most notably on the album's self-titled track, her vocals are glorified whispers in the ears of the listener- “Neutered Fruit” and “Champagne Year” follow suit with this trend. St. Vincent’s real success though is in the repeated embrace of experimental pop sans pretension- the tunes here are all exceedingly listenable but lack aloofness and pandering. As a spotlight album, Strange Mercy maintains a reliable obscurity in the way it uses innovative sounds and textures to frequently dabble within the familiar tropes of previous St. Vincent offerings. The end result is an unpredictable experience for the listener that is somehow equal parts comfortable and exciting. And for these reason I suppose, Strange Mercy is more than a little brilliant.